© Lan Kwai Fong Group 2018. All Right Reserved. Come one, come all to the second annual Japan Street Carnival. The Cool Japan-themed event, part of a month-long celebration, is taking over Lan Kwai Fong on 10-11 November, from 1pm until late. This two-day extravaganza brings the coolest elements of Japan straight to Lan Kwai Fong, with authentic Japanese food and drinks, traditional and contemporary arts and crafts, show-stopping entertainment and more. 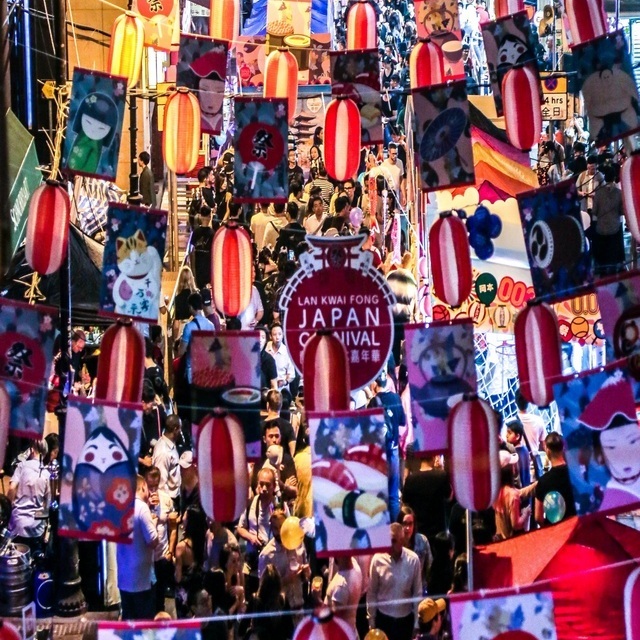 Over 40 different booths will set up shop, turning Hong Kong’s favourite district into a beautiful Japanese Matsuri Market, showcasing the best of the best from Japan’s prefectures. Make sure to arrive early to make the most of all the incredible activities. Excited? Now read on to find our top highlights you can’t miss. Lan Kwai Fong wants to help you fully immerse in their Japanese wonderland, so they’re inviting guests to try on beautiful Yukata, a lightweight kimono, at booths D5-6. But that’s not all, make sure you look your very best with professional, on-site hairstyling and face painting. Now that you’ve had your hair and makeup done by the pros, the only thing to do is make sure you take lots of adorable photos. TAMA and FRIENDS, Japan’s favourite cats, will be prowling the carnival— so grab a selfie. There will also be an enormous illuminated lantern that you can’t miss. Known as a nebuta, it’s a traditional part of an Aomori Prefecture summer festival. A feast for the senses, the signature street parade features taiko drums, Matsuri dancers, live bands, interactive shows and so much more. TAMA and FRIENDS will be walking in the parade, and you can win some cute surprises. If all the festivities are getting you parched, grab a deliciously refreshing Orion Beer from booth B11. One of the top five breweries in Japan, they’ve been in business for over 60 years! Their draft beer is the perfect thing to sip on all afternoon long. If you prefer something sweeter, they’re also mixing up some cocktails, like the Orion Raspberry combination that we can’t wait to try. It wouldn’t be a true Japanese carnival without some live dancing. Don’t miss the Tokushima Awa Dance, a traditional performance with over 400 years of history behind it. If you loved the dancing (hint: you will), stop by booths B13-14 to try popular dishes and sake from the Tokushima region. The carnival will be a dazzling mashup of fashion, culture, drinks and food, but there will also be tons of interactive games. So, step right up to booth B9 and challenge the Watami team to one of their games. You could win any number of prizes, from farm-fresh juices to restaurant vouchers. Hope you’re feeling lucky! Think you know shochu? Think again. Even if you’ve been hitting up all the best shochu spots in town, there’s always more to learn. Stop by Japan Sake And Shochu Makers Association at booths B4-6 to try some of Japan’s best shochu. Make sure to ask about the special brewing processes – and then reward yourself with a bottle or two. Head to the SOMPO Booth B7 for a chance to win one of their many adorable prizes. There’s a very cute “Japanda” panda doll, Japanese snacks, and a few Hong Kong-related treasures too. Come early, before they run out! You can also take pictures with the SOMPO ambassadors in yukata! Japan’s favourite drink may be sake, but there are so many more delicious spirits to try, from plum wine to shochu. Each one is made a little bit differently, and it’s worth trying as many as you can to find a favourite. iichiko at Booth A2 is a great place to continue your exploring. Wanna get this exclusive limited edition LKF Octopus Card and our newly released LKF leather card holder? Come get it while stocks last! *offer only applies on 10th-11th Nov, 2018. It is the policy of the Data User (Lan Kwai Fong Group) to comply with the requirements of the Personal Data (Privacy) Ordinance, Chapter 486 of the laws of the Hong Kong SAR ("Ordinance"). In doing so, we will ensure compliance by our staff with the strictest standards of security and confidentiality. Our Group safeguards all information provided by our Customers and Website users ("Users"). We do not collect any personally identifiable information (“PII”) from Users during their browsing of our Website. When Users visit our Website we record their visit only as a 'hit' and do not collect any PII from them. We will however make a record of the visit that shows only the domain name server (DNS) address, part of their e-mail address, and of the pages visited. We use such information only for preparing general statistics on the usage of our web sites. If PII are collected in the process of making enquires or submitting applications for services provided by different operations within our Group, Users will be informed via the Personal Information Collection Statement of our websites of such purposes and uses, including the extent of their transfer and disclosure; and the right of access to and correction of the collected PII. We set out our general policy and practices in respect of our collection and use of your data. The Data User, in complying with the requirements of the Personal Data (Privacy) Ordinance, Chapter 486 of the laws of the Hong Kong SAR, is committed to safeguarding your privacy on-line, and notify you of certain matters when collecting information from you. This statement may change from time to time, so please check back periodically. By subscription to our newsletter and every time you visit this Website or to use our services, you agree to be bound by this statement at that time in force. We do not knowingly collect or use data relating to children below the age of 16, unless parental consent is provided for any collection and processing of PII in relation to children aged 16 or below. If you sign up for our newsletter on the Website, you confirm that you have reached the age of majority in your country of residence. We use and process the PII we collected through this Website with lawful justifications, including legal basis such as your prior explicit consent, to comply with a legal obligation, for performance of a contract, or in our legitimate interests as a business (such as in connection with the conducting and developing of our business and marketing activities), but only where such are not overridden by your interests and fundamental rights. We describe below how we plan to use your PII, and upon which of the legal basis we rely to do so. Where appropriate, we also identify our legitimate interests as a business. We may from time to time send direct marketing materials promoting products and services to Users. Suitable opt-out facilities will be provided during the direct marketing process. If we add new features or services that might require the sharing of your personal information with an additional advertiser or sponsor, we will provide you with notice and the opportunity to opt-out to receive these offers. We will also get your explicit opt-in consent before we share your personal information with any third-party for marketing purposes. With your explicit consent, we will send you updates via email about all the latest news and / or offers on our Website. You can unsubscribe at any time by clicking the link provided in any email. You can ask us or third parties to stop sending you marketing messages at any time by following the opt-out links on any marketing message sent to you. You can also contact us directly. If we use third-party suppliers or service providers to facilitate our services, we will have to provide your information to these suppliers or service providers offering such services where you choose to use these services. We may disclose or access account information when we believe in good faith that the law requires it. We may also disclose or access account information for administrative and other purposes that we deem necessary to maintain, service, and improve our services. In addition, your information will be accessed by, disclosed or transferred to any person or bodies corporate or division within our Group for legitimate interests to our business for purposes set out above. As the parties mentioned above may have places of business outside Hong Kong, your information may be transferred out of Hong Kong. By subscribing to our Website, you agree to us transferring your information to these parties outside Hong Kong. These parties adhere to their own privacy customs and policies and your information will be subject to said customs and policies. You have the following rights with respect to your personal information: right of access, rectification and erasure (right to be forgotten) of your personal information we hold about you, right to object and restrict of processing of personal information, right to withdraw consent and right to data portability, which includes requesting for migration of your personal information in a structured electronic format to a third-party of choice. You may directly contact us if you wish to exercise these rights. PII collected will be maintained securely in our system. We will only retain such data for as long as it is required to fulfill the purposes for which it was collected. Only authorized staff will be permitted access to such PII, and we shall not release such PII to any external parties except those parties set out in our Personal Information Collection Statement without User's prior explicit consent. You may choose to refuse or delete one or more cookies and still access our Website, but the functionality may be impaired. You may delete cookies from your system after you finish browsing our Website. We use some cookies which are "strictly necessary cookies" and without them you will not be able to browse through our Website. If you decide to withhold your consent or block these cookies, some aspects of our Website may not work properly and you may not be able to access the Website in its entirety. Our Website uses technical cookies, including navigation or session cookies, cookies analytics and functionality cookies, each of which has specific functions. We would like to remind you that by changing or disabling certain cookies may affect the functioning of the Website and your browsing experience.